Devon has the 19th largest economy in England out of 46 ceremonial counties. Situated in the region of South West England, it is a maritime county. Like neighbouring Cornwall to the west, Devon is disadvantaged economically compared to other parts of southern England, owing to the decline of a number of core industries, notably fishing, mining and farming. Consequently, most of Devon has qualified for the European Community's Objective 2 status, particularly around Exmoor, Bideford Bay and the Hartland Point peninsula which is somewhat cut off from industrial Britain due to poor road and rail transport links. These areas of North Devon are, however, only around 50 miles (80 km) by boat from Swansea in Wales. A proposal which has the backing of both the Welsh Assembly Government and the South West Regional Assembly, as well as Devon County Council, is a year-round ferry service from either Ilfracombe or Bideford to Swansea, which it is hoped would stimulate economic growth in both South West Wales and the North coast of Devon and Cornwall. 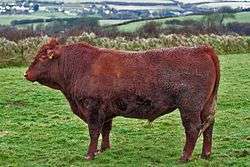 The 2001 UK foot and mouth crisis harmed the farming community severely. The attractive lifestyle of the area is drawing in new industries which are not heavily dependent upon geographical location; Dartmoor, for instance, has recently seen a significant rise in the percentage of its inhabitants involved in the financial services sector. In 2003, the Met Office, the UK's national and international weather service, moved to Exeter. Devon is one of the rural counties, with the advantages and challenges characteristic of these. Despite this, the county's economy is also heavily influenced by its two main urban centres, Plymouth and Exeter. Nearly half of the holdings of the Duchy of Cornwall are in Devon, including a large area of farmland. Since the rise of seaside resorts with the arrival of the railways in the 19th century, Devon's economy has been heavily reliant on tourism. The county's economy has followed the declining trend of British seaside resorts since the mid 20th century, with some recent revival. This revival has been aided by the designation of much of Devon's countryside and coastline as the Dartmoor and Exmoor national parks, and the Jurassic Coast and Cornwall and West Devon Mining Landscape World Heritage Sites. In 2004 the county's tourist revenue was £1.2 billion. The Met Office is in Exeter as is Connaught plc, and Pennon Group, the water company. The Wrigley Company (chewing gum) and HMNB Devonport (the largest naval base in western Europe) are in Plymouth. 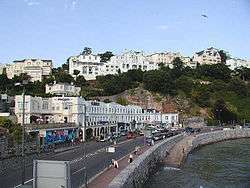 Torquay was home to Beverage Brands, the producers of WKD Original Vodka. Britannia Royal Naval College is at Dartmouth. Mining for tin and copper was carried on in Devon from ancient times until the 1930s: see Dartmoor tin-mining. Agriculture has been an important industry in South West England since the 19th century: approximately 80% of land in the South West of England is in agricultural use (19.6% of England's total). In the later 19th and early 20th centuries there were a number of potteries in the county, mainly based around Torquay in the south (for instance Aller Vale Pottery), and Barnstaple in the north. At first these made high-quality art pottery, but later declined to the manufacture of mass-produced mottoware for the tourist industry. This is a chart of trend of regional gross value added of Devon at current basic prices published (pp.240–253) by Office for National Statistics with figures in millions of pounds. ↑ Devon County Council, 2005. Tourism trends in Devon.